I designed this pattern about 2 years ago , This is the first patterns I have designed , The Christmas tree and A Bell. 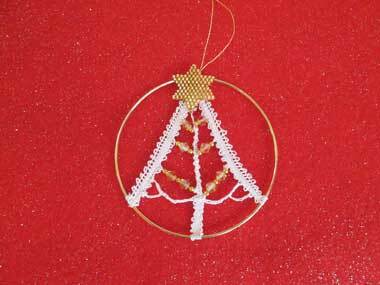 Sallie loves Tape lace and made the Bell , But it is the first time I have made The Christmas Tree. It is just a simple tape lace , I have added 4mm bicone crystal beads and gold spacer beads. I made the star with delica beads , But you could just decorate with a star decoration. I thought it would be good for new lace makers . If anyone would like that pattern I am more than happy to share it.